This is such a fantastic idea for when you’re cooking for a crowd – the pan is cleared for your eggs and whatnot, and nothing requires monitoring or flipping – it’s just baked into a molten, golden, garlicky mess of delicious veg. It’s best to add your spinach in batches, as it does take up plenty of room but bakes down into nothing, so either wilt the spinach all in one go before adding your veg, or add half the spinach with all the other veg before adding the second half after everything has started to cook down. You can customise this with whatever’s in your fridge at the time, which is excellent for avoiding food waste. 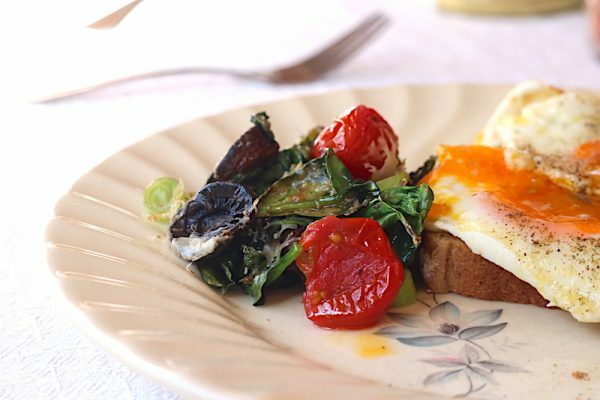 Almost anything can be eaten alongside eggs in the morning! 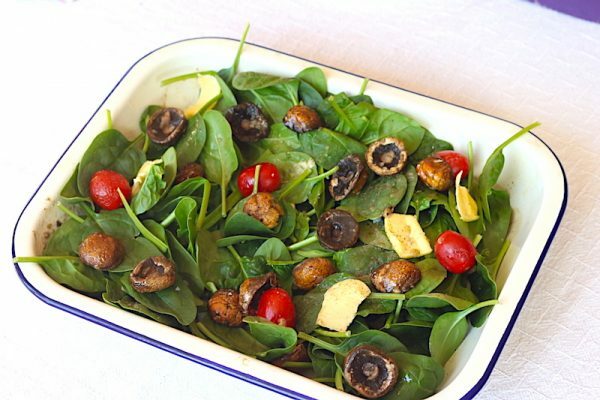 In a large baking dish, toss together the olive oil, garlic slices, the spinach, and some salt and pepper. 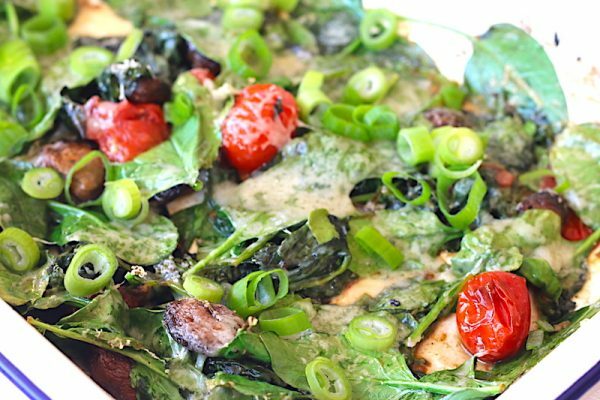 Place in the oven and bake until the spinach is mostly wilted, 5-10 minutes. Add the rest of the ingredients and a little extra olive oil and toss to coat. Grate over the parmesan or dot with feta. Bake an additional 10-15 minutes until tomatoes are soft and the cheese has melted and turned golden.